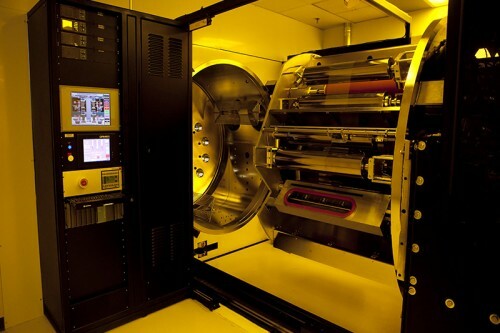 Binghamton’s annual Flexible Electronics Symposium featured discussions of flexible electronics, device and conductor printing and emerging electronic materials. 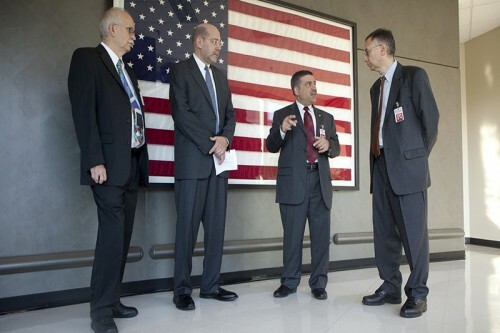 Bahgat Sammakia, director of S3IP, far right, listens to John Pellegrino of the U.S. Army Research Laboratory, second from right, before a tour of the CAMM. They were joined by CAMM Director Peter Borgesen, far left, and CAMM Technical Director Mark Poliks. This high vacuum deposition tool made by CHA Industries was provided to the FlexTech Alliance with funding from the U.S. Army Research Laboratory. John Pellegrino of the U.S. Army Research Laboratory, left, inspects the high vacuum deposition tool with help from Peter Moschak, CAMM facility manager. 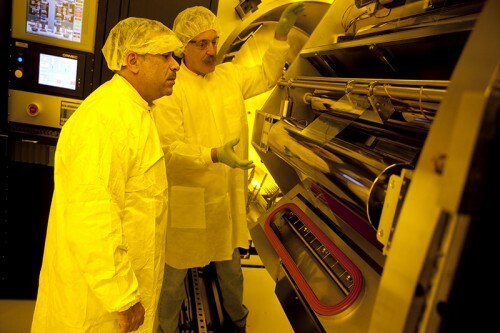 Bahgat Sammakia, director of S3IP, left, and Binghamton doctoral student James Switzer discuss flexible electronics with John Pellegrino of the U.S. Army Research Laboratory in the CAMM clean room. 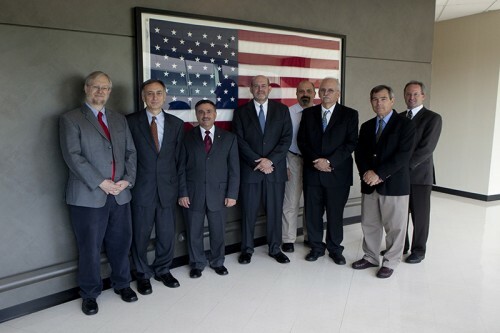 From left: Christopher Ober, Francis Band professor of materials engineering at Cornell University; Bahgat Sammakia, director of S3IP; John Pellegrino of the U.S. Army Research Laboratory; CAMM Technical Director Mark Poliks; David Morton of the U.S. Army Research Laboratory; CAMM Director Peter Borgesen; Michael Ciesinski, president and CEO of the FlexTech Alliance; and Eric Forsythe of the U.S. Army Research Laboratory toured the CAMM before the third-annual Symposium on Flexible Electronics. 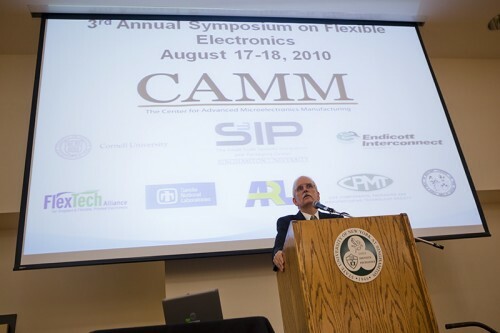 CAMM Director Peter Borgesen opens the third-annual Symposium on Flexible Electronics with an overview of the Center of Excellence. 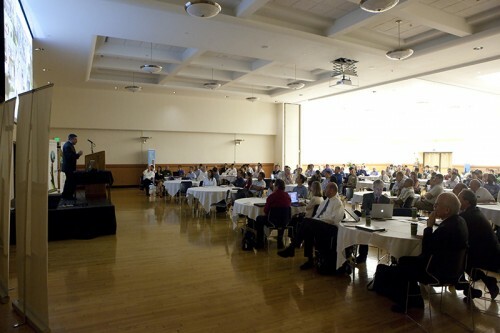 John Pellegrino of the U.S. Army Research Laboratory delivers the keynote address of the third-annual Symposium on Flexible Electronics in August 2010 at Binghamton University.